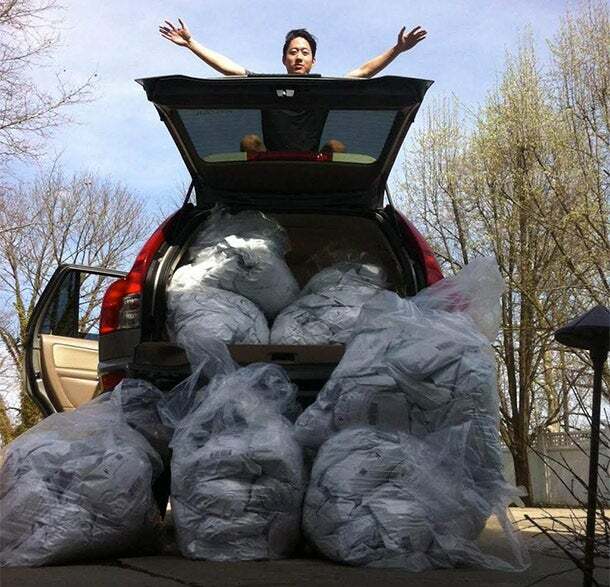 “I am always asking myself, ‘Are we crazy for trying this?’ ‘Is there a reason no one else is doing this?’,” says Jake Huston, the 26-year old co-founder of Threadmason, an online store for custom-fit men’s basic t-shirts. “Then you get a day with a bunch of orders and some really good customer feedback.”. Huston and his Georgetown college buddy Vincent Ko started working on Threadmason a little over a year ago. Last November, they wrapped up a Kickstarter campaign that raised almost $35,000 from about 550 backers. Threadmason.com opened for business and Kickstarter pre-orders went in the mail on April 15 of this year. Shirts run approximately $35 and customers pick from one of 24 sizes depending on a few body measurements. The months following Threadmason’s successful crowdfunding campaign have been a whirlwind, both logistically and emotionally. Part of what its founders have had to learn is patience. “There is always this early honeymoon phase where you get into something like this and you think you are going to be making millions of dollars in 12 months,” says Huston, who worked at a design firm in Brooklyn, N.Y., before dedicating himself to Threadmason full time. As of mid September, Huston and Ko weren’t making millions. While they declined to comment on their financials, they said they are reinvesting most of their profits right now. “Being bootstrapped usually means sweating it out in the beginning,” Ko added. Ko previously worked in the fashion space, launching Panda, an accessory company best known for its wooden sunglasses. He still owns a piece of Panda, but is no longer involved in day-to-day operations. He tends to be the more numbers-focused one in his current co-founder relationship. “We are very ying and yang,” he says. Ko and Huston sorted, packaged and mailed their Kickstarter orders all on their own. Here, Ko sits victorious on the first shipment, ready to go in the mail. As Threadmason enters its next phase of growth, Huston and Ko are trying to figure out how to get new potential customers familiar with Threadmason. They are experimenting with women’s sizes, but aren’t sure just when and how to expand their product line. While Threadmason still has a lot to figure out, its founders have learned some valuable lessons already. Here’s their best advice, one year in. Talk to your customers as much as you can. For Huston and Ko, picking up the phone and talking to their first customers -- their Kickstarter backers, whose contact information they had -- directly influenced their company identity. In doing so, they realized that Threadmason was less of a lifestyle brand and more of a service in their customers’ eyes. Their first customers ranged from Chuck Taylor-wearing hipsters to middle aged men self-conscious about their changing figure -- and no single lifestyle brand was going to include all of their customers. Instead, they focused Threadmason to be a service-oriented company. They streamlined the homepage, decreasing the number of photos and setting up the website with the look and feel of a software website. Stay focused on your next hurdle. As a self-proclaimed “big-picture thinker,” Huston said he was initially thinking too much about what Threadmason would look like as a $5 million company. He has learned that, to keep the business moving forward, he has to focus on the here and now. “We kind of got a little too far ahead of ourselves. So our main focus now is every morning: how can we get more customers? How can we get our concept in front of more people?” he says. 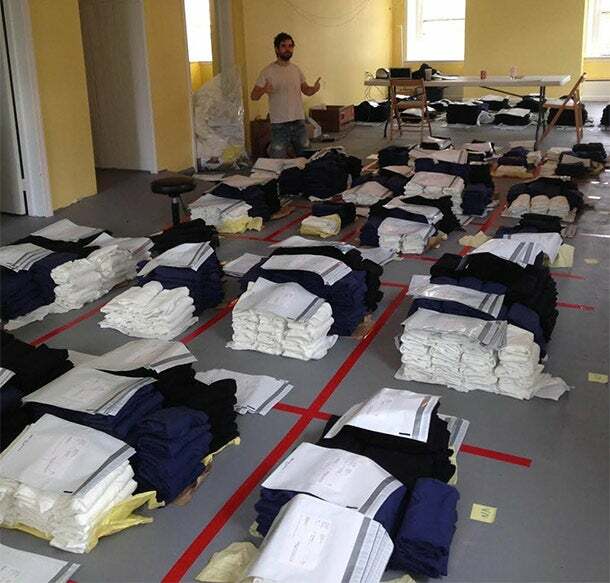 So far, Threadmason has worked with about 1,000 men looking to be fitted for custom t-shirts. Geek out on data, minimize excess inventory. At many retailers, clothing sizes tend to be offered in a “1, 2, 2, 1,” pattern -- or one extra-small for every two mediums, two larges and one extra-large. Threadmason, though, has a minimum of 24 sizes. That’s a back-breaking load of inventory to try to carry as a startup. So Huston and Ko became obsessive about tracking their customer demographics with the Kickstarter pre-orders. Huston is seen here sorting Threadmason's first production run into the 24 sizes offered for the men's basic t-shirt.